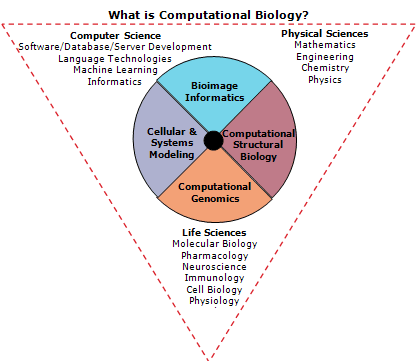 Computational Biology is the research field concerned with solving biological problems using mathematical and computational methods. It is grounded in theories and concepts of life, physical and quantitative sciences. The methods have their origins in various scientific computing traditions including those in physics, chemistry, engineering, and computer science. Researchers in this field must be comprehensively trained on the current state-of-the-art to acquire the quantitative background and skills to advance the field, and be in a position to appreciate the potential, strength and limitations of computational, mathematical, and engineering tools for tackling biological problems. beyond single molecules/pairs, but model networks/cascades of interactions. realistic visualization and simulation of complex processes. Computational biology is being recognized as an essential and indispensable field in biomedical research. This has gained tremendous popularity in recent years due to the availability of high computing power to scientists, development of user-friendly graphical-user interfaces in commonly used software applications, and the efficiency with which these studies can be carried out relative to traditional methods. 1989 – First degrees awarded in undergraduate computational biology program at Carnegie Mellon. Courses developed for this program stimulated interest among graduate students, as well. 1999 – Mellon College of Science receives grant from the Merck Company Foundation to create a new program in computational biology and chemistry, which supported both undergraduate and graduate students, and thereby helped to stimulate development of interdisciplinary, collaborative projects. A major limitation of the Merck program was that students had to be enrolled in one of the traditional Ph.D. programs. 2001 – In March, the University of Pittsburgh School of Medicine establishes the Center for Computational Biology and Bioinformatics (CCBB), through the initiative of the Senior Vice Chancellor for the Health Sciences. The Center’s charge was to advance and disseminate computational biology methods and results, integrate the diverse activities in these areas that were ongoing across Pitt, and build additional expertise and capacity in computational solutions to key biological questions. 2004 – Built on the premise of the founding CCBB, the Department of Computational Biology (DCB) was created at the University of Pittsburgh, School of Medicine, in October 2004, to establish a home uniquely welcoming to highly interdisciplinary faculty, and to firmly establish the University of Pittsburgh in a nationally recognized leadership role in a field of tremendous growth and excitement. 2005 – A new Ph.D. program in computational biology is established. Founding Directors were Ivet Bahar and Robert F. Murphy, with the first students enrolled in Fall 2005. This is a natural consequence of the educational goals and research progress of the CCBB. In November, the program is selected as one of only ten HHMI-NIBIB Interfaces Initiative Awardees in the country. 2007 – At Carnegie Mellon, the Ray and Stephanie Lane Center for Computational Biology (LCCB) is created as the culmination of many years of development and recruiting efforts, and with the goal of realizing the potential of machine learning for expanding understanding of complex biological systems. A primary focus of the center is developing the computational tools that will enable automated creation of detailed, predictive models of biological processes, including automated experiment design and data acquisition. 2009 – CPCB was selcted as one of ten programs nationwide to receive an NIH T32 Training Grant as part of the NIBIB-HHMI Interfaces Program (award T32-EB009403). The Department of Computational Biology (DCSB) at Pitt and the Computational Biology Department (CBD) at CMU together serve as the administrative homes of the CPCB at the two universities. Dr. Ivet Bahar, the John K. Vries Chair of the DCSB, and Dr. Robert Murphy, Head of the CBD, are the founding directors of the CPCB. The DCSB at Pitt is located on the 3rd floor of the Biomedical Science Tower 3 (BST3), constructed in 2005. BST3 has been designed to promote interdisciplinary research, housing 50 research groups, including basic science departments such as structural biology, neurobiology and computational biology; and research centers or institutes for proteomics, drug discovery, vaccine development, tissue engineering, and nanotechnology. In addition to its ten Core Faculty members, the department has 26 Joint Faculty, 16 postdoctoral fellows, and 17 graduate students currently working with the Core Faculty. The DCB students are enrolled in various doctoral programs, including CPCB, Physics, Molecular Biophysics & Structural Biology, and Biochemistry & Molecular Genetics. The DCSB also organizes the NSF-funded REU TecBio, a cross-institutional effort, which aims at introducing quantitatively skilled students from many disciplines to the field of computational biology, and enabling them to make more knowledgeable career choices. The Lane Center for Computational Biology at CMU was created in 2007 as the culmination of many years of development and recruiting efforts and with the goal of realizing the potential of machine learning for expanding understanding of complex biological systems. In 2009, the LCCB became an academic department in the School of Computer Science and moved into the new Hillman Center for Future-Generation Technologies, part of the SCS Complex. In 2015, the Department name changed to “Computational Biology Department”, and the Lane Center for Computational Cancer Research was formed with the cancer-related mission of the original Lane Center. The CBD has 39 core and affiliated faculty members. All students in the CPCB who are supervised by CMU faculty have office space in the Hillman Center. In addition to students and faculty, the Computational Biology Department also houses a prestigious, highly competitive, and well-compensated postdoctoral fellow program, the Lane Fellows in Computational Biology. These fellowships are awarded after nomination by a candidate’s thesis advisor, and after an extensive application and interview process. The Fellows make important contributions to the research and training activities of the CPCB. In addition to the DCSB and the CBD, there are a number of other departments, institutes, and research centers that demonstrate how vital the CPCB is to the Pittsburgh area. The list below covers a selection of units with most extensive participation among the CPCB Training Faculty. The CPCB has in place a set of administrative rules to promote seamless interactions across the two campuses. 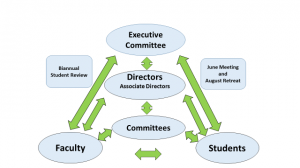 Strong administrative commitment on both sides continues to ensure that students and faculty can work with a single, consistent set of rules and guidelines, despite occasional differences in university policies. A schematic description of the administrative structure of the program is presented below. The two program directors, Drs. Faeder and Schwartz, are jointly responsible for all aspects of program operation. They chair the Executive Committee, the ultimate decision-making body of the program, and they oversee the Admissions Committee and the Curriculum Committee. The program administrative personnel consists of two Student Recruiting and Education Administrators, Dr. Joseph C. Ayoob (Pitt) and Dr. Joshua Kangas (CMU); and two Program Coordinators, Ms. Kelly Gentille (Pitt) and Ms. Nicole Stenger (CMU). This program was established in 1999 to provide professional training to students seeking employment in the biotechnology, pharmaceutical and genomics industries. It draws on courses created for the undergraduate and graduate programs and has had a 100% success rate in job placement for its graduates to date.Ph.D. programs in Biological Sciences, Biomedical Engineering, Language Technologies, Machine Learning, and Computer Science. These departments (among others) have in the past recruited a number of students interested in computational biology (through the Merck Program, for example). The Program in Neural Computation (PNC) is a graduate training program in computational neuroscience for students seeking training in the application of quantitative approaches to the study of the brain. Specifically the program is designed to take advantage of the world class strengths of Carnegie Mellon University and the University of Pittsburgh in areas including computer science, machine learning, statistics and dynamical systems and to train students to apply these tools to critical problems in neuroscience. The Joint CMU-Pitt PhD Program in Computational Biology strives to establish a climate that celebrates diversity and promotes respect for the contributions of all. Both Carnegie Mellon and the University of Pittsburgh share in this goal and as such there are various organizations available to promote diversity. 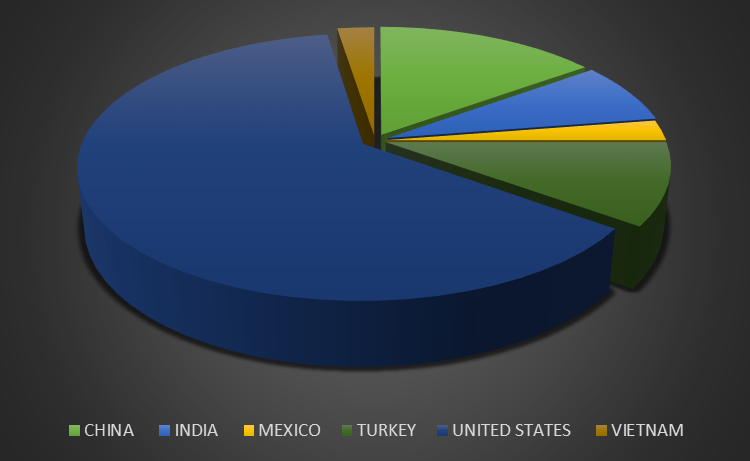 The CPCB brings together students from around the world to study computational biology. This diagram shows the home countries of our current students. In all, 11 countries are represented. Our training faculty is equally diverse.